Photograph depicts snowy mountaintop, wooden shelter and truck in foreground. Corresponding note on accompanying photo description page: "Pictures taken July 2nd, 1952. 1. Picture taken from campsite showing snow on talus." Photograph depicts flat area mostly covered in snow. Corresponding note on accompanying photo description page: "11. Indicates snow conditions in the cirque. Taken from near first switchback." Photograph depicts a cleared path through the snow and trees, mountain in background. 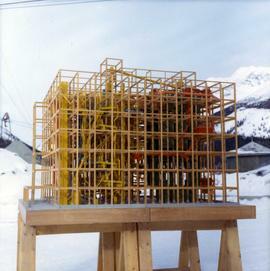 Wood box and post semi-visible in foreground. Handwritten annotation in blue ink on recto of photograph: "You will notice we have a little snow here." View of crusher building from above, featuring the bottom level foundation. A dirt road and long building believed to be housing conveyor "B" cross the midground. Valley in background. 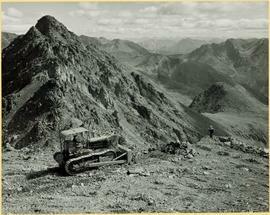 Handwritten caption beside this photo reads: "Damage to Cassiar Grader, result of hazardous access to site". Rocks and rubble in foreground, mountain in background. Grader appears to be sitting on edge of cliff. 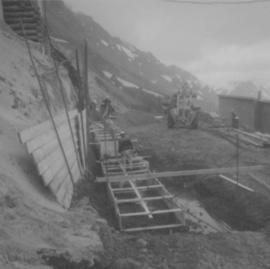 Photograph depicts different levels of crusher foundations built into mountainside. 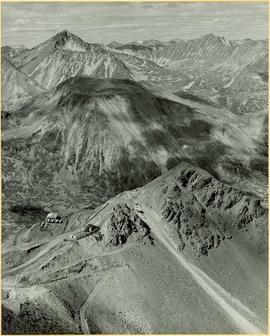 Dirt piles and unidentified machinery in foreground, power lines and mountain range in background. Handwritten caption below this photo reads: "Completed Foundations for Crusher, with forms being stripped." Men can be seen working on site. Switchback road, power lines and tramline towers are believed to be in valley in background. Photo depicts workers at construction site of Cassiar's new mill building. 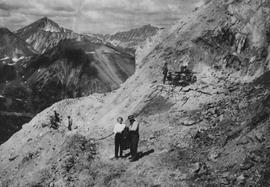 Photograph depicts two unidentified men on road or mining bench at high elevation on mountain, valley in background. Photograph depicts two men standing to left of Fred Murray on balcony of large building or structure speculated to be in the Cassiar valley. Portion of log structure in left foreground, man and hauling trucks on road in background. 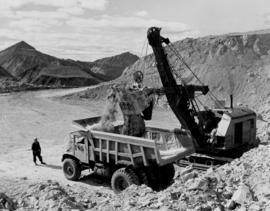 Photograph depicts shovel loading Kenworth haul truck in mine. 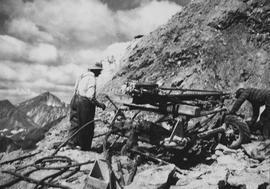 Unknown man stands on left, mountain range in background.